What’s the scoop on Edamame? I LOVE edamame. Whether making it from frozen at home or receiving it as an appetizer at dinner. These beans are a part of the soy family and are packed with nutritional content and delicious flavour. Edamame is rich in protein, iron, and fibre. 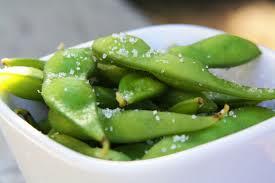 In terms of protein, edamame contains all the essential amino acids similar to what is found in meat products. This is why edamame is a great addition to your diet if you are vegetarian and not meeting “complete” protein requirements. Protein is extremely crucial for muscle synthesis, muscle development, and maintaining a strong healthy body. Iron is another significant nutrient in edamame. Iron is needed to transport oxygen throughout the body to our muscles and tissues. Therefore, iron also plays a large role in muscle development, cardiovascular health, and maintaining that strong healthy body. Fibre is another abundant nutrient that is beneficial to our health and found in edamame. Fibre is needed for regular bowel movements and to promote/maintain a healthy digestive system. With all those benefits why not include edamame into your diet? It is great to eat the beans on their own or combine into stir fries and vegetable dishes for extra nutrition! How do I enjoy my edamame? Steam it in the microwave and add some ground sea salt…mmm! (Just like in the picture).